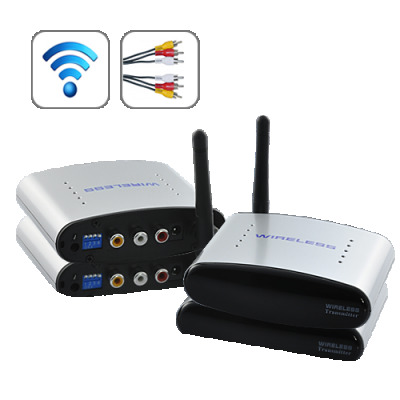 Successfully Added Wireless Audio Video Transmitter Receiver System with IR Remote Extender to your Shopping Cart. Wires be gone, because one cable box and one cable line is all you need with the Wireless Audio Video Transmitter Receiver System with IR Remote Extender. Wirelessly streaming near-HD quality video and high quality audio to any TV in your house, let this Wireless Audio Video Transmitter Receiver System enhance your media entertainment experience now! 1) Connect the wireless transmitter to your main audio/video source using an AV cable. 2) Connect the wireless receiver to any TV in any room using an AV cable. 3) That's it, you're done! Enjoy free, wireless streaming in another room from your TV set-top box (STB), DVD player, CCD camera, DVR, or any other AV signal output devices. In addition, the Wireless Audio Video Transmitter Receiver System includes an IR remote control extender as well as four user selectable channels (allowing for multiple transmitters to be operated with multiple receivers in the same area). All these advanced features will fill your home life with amazing convenience. The Wireless Audio Video Transmitter Receiver System with IR Remote Extender is available in our warehouse now for immediate orders. Best of all, its pays for itself in not having to rent additional cable boxes from your provider - JUST GET IT! Brought to you by Chinavasion, the leader in wholesale electronics. AV IN: TV Set Top Box (STB), MP4 Player, DVD Player, Stereo System, Video game System, Camcorder, etc. Although some time there was some blink due to blank frequency but overall is good vs. to the offering price. Good delivery, only 5 days to Indonesia.